If, like us, you are experiencing a heatwave and rain is just a distant memory, we’ve got some tips on how to stay cool. Whilst many of us love the sun and are delighted to be able to leave our umbrellas at home, it’s worth remembering that extreme heat can cause health problems and make even everyday tasks feel much more strenuous. A bit of planning and following these simple hints will mean you can go about your day feeling good and looking great. Here are some easy ways to stay safe and comfortable, and to enjoy the summer while it lasts. Most of us don’t drink enough water or non-sugary liquids during hot weather. This is especially important if you are pregnant or have low blood pressure as it will help your body regulate blood pressure and replenish any fluids lost through sweating. Drink two glasses of water as soon as you wake up and keep drinking regularly throughout the day. This will also help prevent headaches and dizziness. Fill up reusable bottles of water each evening and put them in the freezer so they are ready and icy cool for the day. Stick these in packed lunch boxes for a ready-made food cooler. Avoid alcohol and caffeinated drinks. Alcohol will make you more dehydrated, and caffeine increases the metabolic heat your body produces and constricts the blood vessels. Stick to juices, herbal teas and water. If you are feeling really dehydrated an energy drink or a drink with electrolytes can help restore balance. 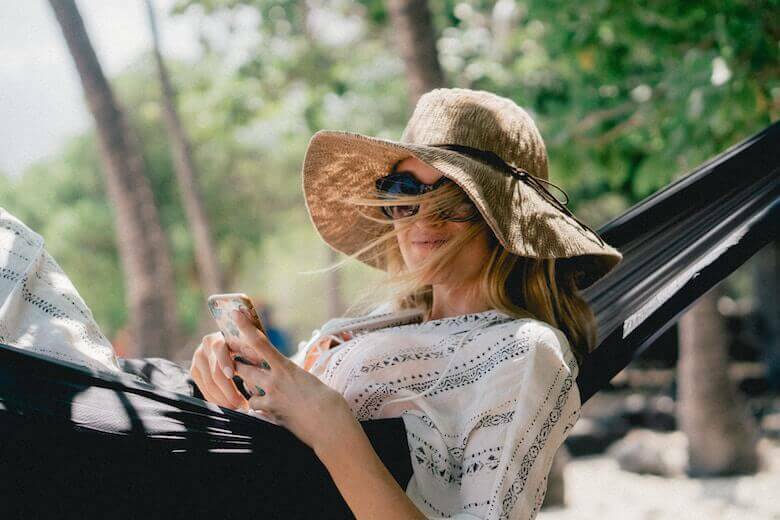 Clothes and bedlinens made from natural fibres such as cotton and linen are way more comfortable during hot weather than man-made fabrics that trap in heat. Linen is renowned for wicking away moisture from your body and helping you stay at an optimal body temperature. It is also anti-bacterial, so if you do sweat there won’t be unpleasant odours. Go for flowing linen dresses, pretty linen tunics or loose trousers and a hat. 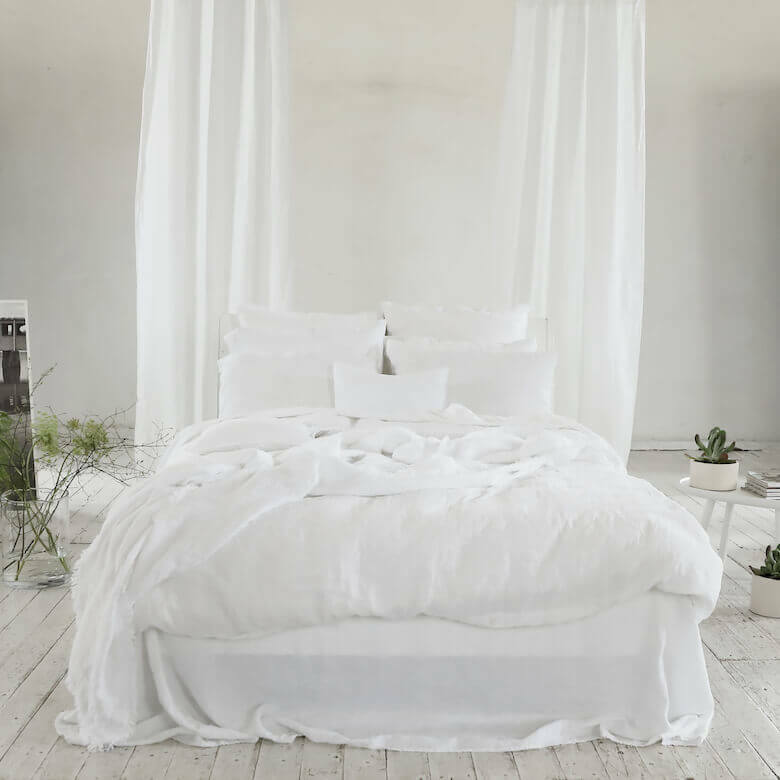 At night make sure your bedlinens are pure linen as this will help you sleep better and avoid that stuffy, sweaty sensation on waking that other fabrics can cause. Use pillows and duvets made from natural materials as these will keep you cool, or ditch the duvet altogether and just use a top sheet. Some people swear by putting their sheets in the fridge or freezer for a few minutes before they go to bed (keep them in a sealed plastic bag though!). Make sure you wear a good SPF that filters both UVA and UVB rays, and top up if you’ve been swimming or outside for a few hours. If you have kids try to get them into the habit of applying sunscreen at the same time as they brush their teeth in the morning so it becomes part of their normal daily routine. Keep your skin covered either by choosing longer clothes, or take a lightweight linen scarf out with you and use it to protect your shoulders or legs if you are sitting on the beach or having a picnic. If you can, stay indoors or in the shade for the hottest part of the day and avoid too much physical exertion in the heat. Now is not the time for building that shed you’ve always wanted or digging over the flower beds. If you jog, try to schedule your runs early in the morning or at dusk, when temperatures have dipped. A fresh breeze will make a hot office or house far more bearable, so get yourself a good fan. There is a reason Mediterranean houses so often have shutters: it’s the best way to keep out the worst of the day’s heat. Although it might seem counterintuitive, drawing the drapes or closing the blinds during the day will keep your house cool. Blowdrying your hair in a heatwave can be a distinctly unpleasant experience, especially if you then try to apply make-up to a sweaty face. Try washing your hair at night so you’re not using extra heat when temperatures are at their highest. Wear your long hair up or take the plunge and go for that pixie cut you’ve dabbled with. Use moisturisers sparingly if your face perspires and choose one with hyaluronic acid as this not only plumps up the skin, it draws in moisture from the air. Face powder can be better than foundation if things get slippy, or simply apply concealer where you need it and let the rest of your skin breathe. You can also dab some powder on your chest if it needs a bit of mopping up. Eyeliner reacts better to heat than eyeshadows, which can clump or run, and apply a waterproof mascara to avoid panda eyes. Have you got any other tips for staying cool in summer?